Last Saturday morning, after my coffee, I felt like doing nothing. I thought about going to the gym but I figured the treadmills were all taken since Saturday mornings are usually quite busy there. Maybe I was just making excuses. Either way, I ended up on the couch, flipping through television channels. TNT, nothing good was on, USA, nothing, Lifetime, no, then The Food Network, Paula and Bobby Deen where cooking. America knows and loves Paula Deen for her traditional southern cooking. Today, she was cooking with citrus. Her orange citrus bars caught my attention because they were similar to a traditional pound cake my mother and aunts made every Christmas. My sister and I would even beg to eat the batter. Why? It was creamy and so citrusy with tons of lime and orange zest adding to the flavor. As I am sure I have mentioned before, I spent the first eight years of my life on an island country side where my father own acres of citrus and other fruit trees. Therefore, citrus was a regular part of our diet. Sometimes, we would have bowls of tiny tangerines as a snack, making it into a game: who could eat the most. Of course, we would wake up five times a night to use the bathroom but it was a small price to pay for the joy of sweet, refreshing citrus fruits. 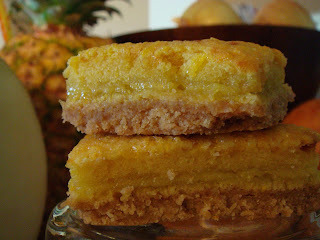 So, I decided to make Paula Deen's orange citrus bars. There was one caveat, however. The other well know fact about Paula Deen is that she cooks with a tremendous amount of butter. I do not. I have no problem with people who cook with butter; it is a personal choice and I simply choose to use the least amount of butter and only when necessary. (That does not mean I won't eat buttery cakes and pastries when given the chance. Oh no! I'm not that disciplined. ) Paula's recipe called for 2 sticks of butter; I used only two tablespoons but added some vegetable oil while also using less sugar. The result of my lazy Saturday morning was this chewy, citrusy dessert which I just can't wait to make again. 1. Set oven to 350 degrees F.
2. Combine flour, oil, butter sugar and lime zest so that they form a crumbly consistency and stick together when compressed. 3. On a well greased baking dish, (I used a 9" pie dish) press the flour mixture unto the bottom to form a thin layer. Bake for 15 to 20 minutes until lightly golden brown. 4. Meanwhile, combine egg and egg white, 1/3 cup of sugar, orange juice, orange zest and lemon extract. Beat until well combine. 5. In a separate bowl, mix together flour, baking powder, and baking soda. 6. Once crust has been baked, remove from oven. Only then, combine flour and and egg mixtures. Stir to combine but do not over mix. 7. Add filling mixture to crust and bake for 20 minutes or until a tooth pick inserted comes out clean. 8. Let cool for 5 minutes in dish and cut into bars. Place on wire rack to cool.